On the night of 22-23 April 1918, the Royal Navy (RN) carried out an audacious raid on the German held ports of Zeebrugge and Ostend in occupied Belgium. The purpose of the raids was to render the ports unusable as U-boat and destroyer bases. The plan was to steam three obsolete cruisers through the harbour and sink them as block ships in the Zeebrugge Canal. To do this, however, also required a landing force to take over the breakwater, known as the mole, that protected the harbour and on which the Germans had mounted numerous artillery pieces and machine guns. Among the hundreds of RN and Royal Marine personnel involved in this action were a small group of Royal Australian Navy (RAN) volunteers. In February 1918 a call went out throughout the RN for volunteers to perform a hazardous service. At this time the battle-cruiser HMAS Australia was serving with the RN in the North Sea and 11 men from her ship's company were selected from the dozens that volunteered. These men were: Artificer Engineer (Warrant Officer) William Edgar, RAN, Leading Stoker William Bourke, Leading Stoker Reginald Hopkins, Leading Stoker Godfrey Lockard, Leading Stoker James Strong, Stoker Norbert McCrory, Leading Seaman George Bush, Leading Seaman Dalmorton Rudd, Able Seaman George Staples, Able Seaman Henry Gillard, and Able Seaman Leopold Newland. A 12th man, Stoker John Walter Carter, was selected for the raid but did not take part due to illness. Throughout February and March, a force of 82 officers and 1698 men was raised and given specialist training at either Chatham dockyard or the Royal Marine Barracks at Deal. Many of the sailors were formed into 200 man 'storming parties' and given instruction in trench warfare, assault tactics, bomb throwing, bayonet drill, and the use of mortars and Lewis machine guns. Others were given training in demolition work. HM Ships Daffodil and Iris II. Artificer Engineer Edgar served in Iris II during the raid on Zeebrugge. One hundred and sixty-five vessels including cruisers, destroyers, monitors, submarines and motor launches were involved in the raid and many of the attacking ships were specially modified in the preceding weeks. Artificer Edgar was allocated to the ferry boat HMS Iris II, the five seamen to the cruiser HMS Vindictive and the five stokers to one of the three block ships, HMS Thetis. The Germans had heavily reinforced the Belgian coast with artillery, while in Zeebrugge, artillery emplacements ranging in size from 3.5-inch guns to 6-inch guns had been positioned within the port area. These were supported by 11-inch guns mounted further inland. All of these batteries were connected by an elaborate complex of observation, command and signalling stations. 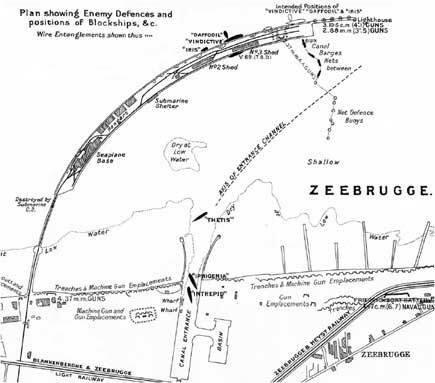 The Zeebrugge mole was a seaward outpost of the German coastal defence system and consisted of three parts: a railway viaduct connecting the mole to the shore; the mole itself, constructed from a mass of masonry that curved to the north east; and, a narrow extension projecting from the end of the mole with a lighthouse on its extremity. All of this had been converted by the Germans into a minor fortress supporting gun emplacements and housing garrison troops. At the south western end of the mole was a seaplane base with concrete sheds to store the aircraft and its own garrison. Unsuitable weather conditions forced two attempts to launch the raid to be aborted but by 22 April conditions had improved. That afternoon the raiding force weighed anchor and began to assemble under thickening cloud cover. As they made their way to their target, drizzling rain began to fall but wind conditions remained favourable. By 10:00pm the force rendezvoused with patrolling destroyers and the superfluous men in the block ships had been taken off by motor boats. The leading ships were now only 15 miles from the mole. At 11:10pm the British monitors began bombarding the German coastal defences with fire being directed at Zeebrugge some 20 minutes later. At the same time coastal motor boats moved off at high speed and laid a preliminary smoke screen across the entire line of advance. Other smoke laying craft followed and soon a murky line of smoke stretched for almost eight miles running parallel to the coast. Two groups of coastal motor boats then attacked the western end of the mole to distract the enemy's attention while Vindictive approached. Miraculously the entire expedition had reached its destination unreported and unobserved. Just before midnight the Vindictive came through the last smoke screen, moving across the narrow strip of water that separated her from the mole. She continued her approach under a hail of fire which inflicted heavy casualties on her crew and killed most of the officers in charge of her landing parties. The tidal stream was also causing problems for Vindictive as she struggled to lay alongside the mole. Fortunately the ferry Daffodil saw her predicament and in what has been described as an extraordinary piece of seamanship was able to push, and hold, Vindictive alongside the mole. The first of the storming parties, which included five of the Australian sailors, then made their way along the narrow swaying gangways to begin their assault. A few minutes later Iris II was brought alongside the mole ahead of Vindictive. Vindictive being pushed alongside the mole by Daffodil. It was soon realised that there could be no thought of rushing the mole head battery as had originally been intended. The Vindictive had gone past her assigned position leaving German machine guns and barbed wire between the storming parties and the gun emplacements. Consequently the mission changed to one of holding ground, as a diversionary measure, despite the attackers being the focus of nearly every German gun. By now Vindictive's upper works were being pounded by the gun battery on the mole and were soon reduced to a mass of twisted steel. Many of her guns had been knocked out and casualties were mounting as two German destroyers berthed alongside the inner mole added their fire to the fight. Twenty minutes after the Vindictive had been put alongside, the situation ashore was precarious. The Royal Marines had formed a bridge head opposite the ship's brows while the seamen had only partially secured Vindictive to the mole. Meanwhile the obsolete British submarine HMS C3, packed with several tons of high explosives, had penetrated the harbour. Her mission was to lay alongside the railway viaduct connecting the mole to the shore and set timed explosive charges before abandoning the vessel. Her captain, Lieutenant RD Sandford, RN, left nothing to chance. He rammed the viaduct wedging his submarine tightly between its steel girders before he and his crew made good their escape in a small skiff under a hail of enemy fire. The resultant explosion blew away 100 feet of the viaduct and cut communications to the mole as the three block ships Thetis, Intrepid and Iphigenia were steaming into the harbour. Australian born Lieutenant John Howell-Price, DSC, RNR was second in command of C3 and was awarded a Distinguished Service Order (DSO) for his bravery. Australian born Lieutenant John Howell-Price, DSO, DSC, RNR. He was awarded the DSO for bravery in destroying the viaduct at Zeebrugge. Medals on display at the Australian War Memorial, Canberra. The block ships passed through the battery fire and steamed on towards the channel and canal beyond it. Thetis had by this time sustained heavy damage and was taking on tons of water causing her to list heavily. She was brought to a halt 500 metres from her objective but had cleared the way through the nets and obstructions, allowing Intrepid and Iphigenia to pass through unimpeded as they made their way up the canal. Intrepid entered the channel and once inside, her wheel was put hard over and the ship scuttled. Most of her crew got away in two cutters and a skiff. Iphigenia was not far behind and she made for a gap on the eastern side of the channel where she too was successfully scuttled. Her crew escaped in boats which they rowed out of the harbour before being picked up by fast motor launches. Back at the mole the Vindictive continued to draw fire. The recall was sounded and the shore parties withdrew to their battered ships, carrying their wounded with them. Twenty five minutes later Vindictive and Iris withdrew and made for open water. As they left the scene Iris came under direct fire from the German batteries and was riddled with shells, mortally wounding her commanding officer. On fire and with half of her bridge blown away she eventually steamed out of range. 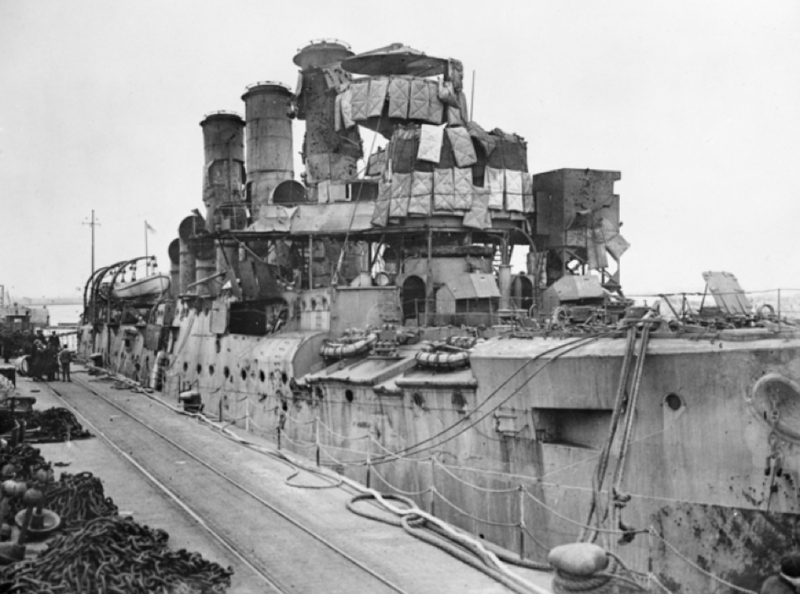 Damage sustained by HMS Vindictive was extensive as can be seen in this photograph taken at Dover on her return to England. Left: Damage to one of Vindictive's funnels. Right: Ratings, officials and workmen inspect the damage to Vindictive in Dover. 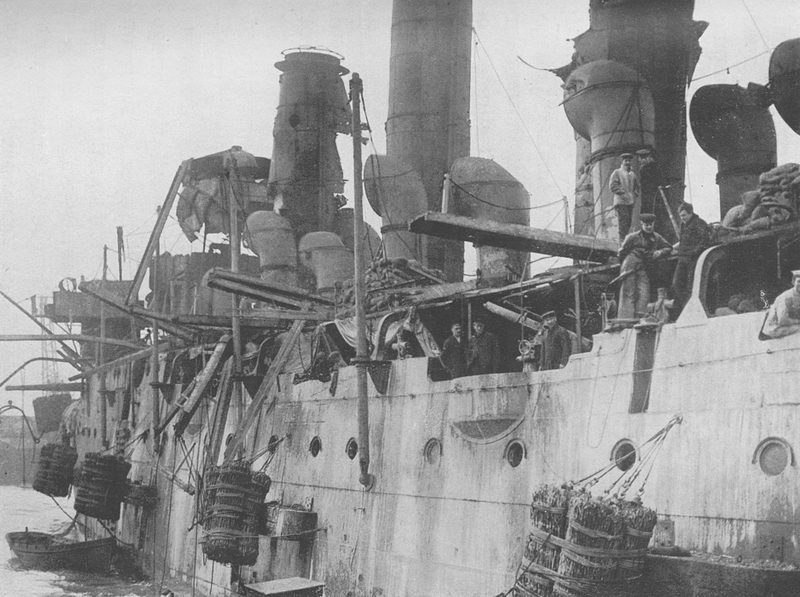 The bullet-ridden block structure at the right of the photo was one of the flame thrower postions added to the ship prior to the raid. The fenders and boarding gantries used when Vindictive came alongside the mole. 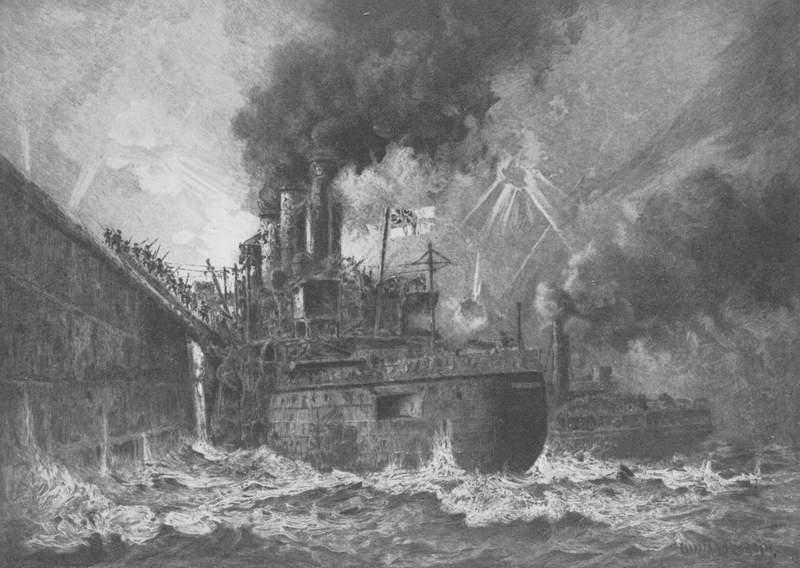 The attack on Zeebrugge proved only a partial success. 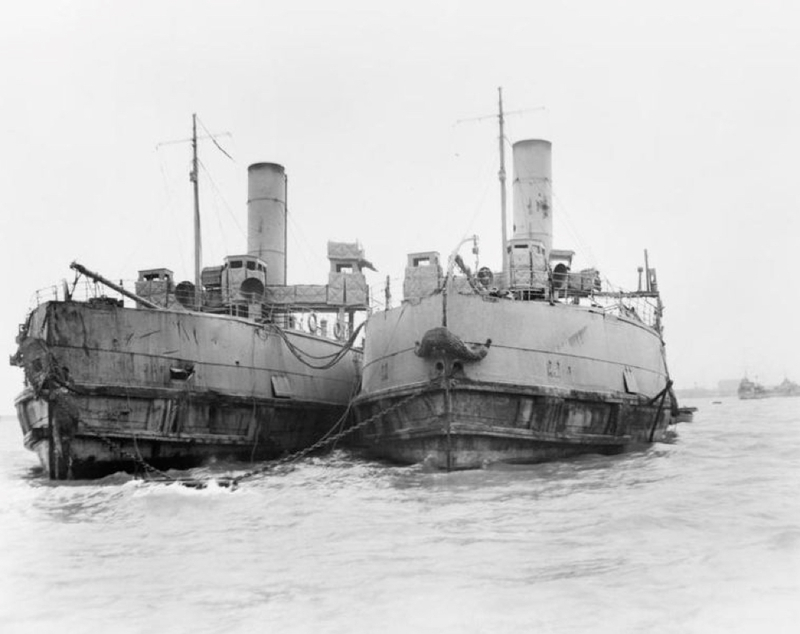 Although the harbour and canal were blocked for several weeks the Germans soon dredged a channel around the sunken blockships allowing the destroyers and submarines to pass by; albeit with extreme difficulty. During the attack 214 British personnel were killed, 383 wounded and 16 taken prisoner. The Australians were extremely lucky, with all emerging unscathed despite being in the thick of the action. The exceptional bravery shown by those who took part in the raid was recognised through the award of 11 Victoria Crosses (VC), 31 Distinguished Service Orders (DSO), 40 Distinguished Service Crosses (DSC), 16 Conspicuous Gallantry Medals (CGM), 143 Distinguished Service Medals (DSM) and 283 Mentions in Despatches (MID). The Belgian Government also later made a number of awards for bravery. In recognition of distinguished services during the operations against Zeebrugge and Ostend on the night of 22-23 April 1918. It was due to this officer that HMS Iris kept going during the action under very heavy fire and, though holed several times, succeeded in returning to base under her own steam. He did valuable work in the engine room and boiler room throughout the operation for a period of 17 hours without rest. He showed great bravery when the ship was under very heavy fire, by coming onto the upper deck and with the help of an engine room artificer, turned on the smoke apparatus. Left: Artificer Engineer William Edgar, DSC. Right: His medals on display at the Australian War Memorial, Canberra. 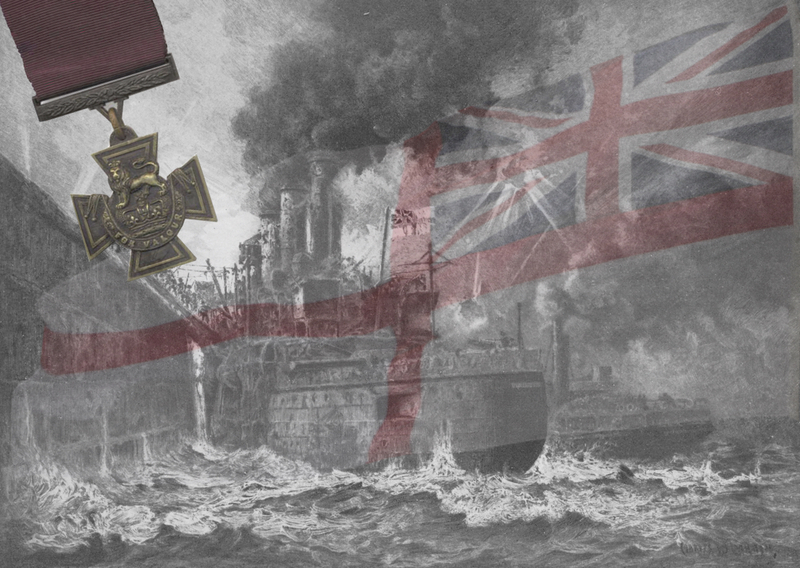 Four of the VCs won at Zeebrugge were decided by ballot which allowed for a recipient to be elected by those present at the action when it was considered that the corporate bravery of a unit warranted the award. One of the Australian sailors, Leading Seaman Dalmorton Rudd, was nominated for the award of the VC in this manner. 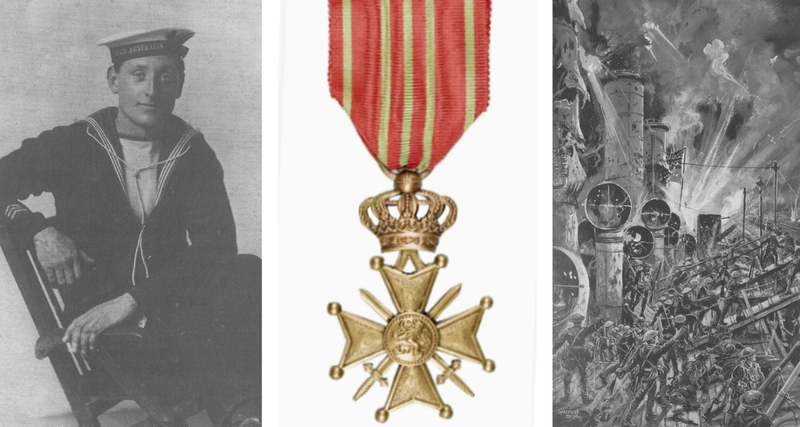 Although he did not ultimately receive the award he was awarded a DSM along with his ship mates Leading Seaman George Bush and Able Seaman George Staples. 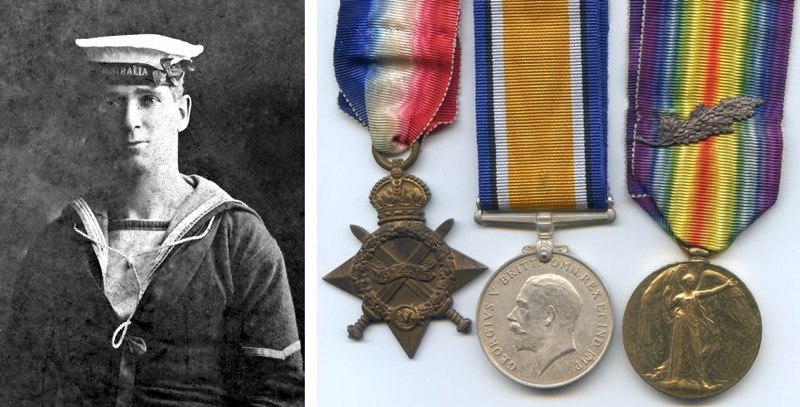 Leading Seaman Dalmorton Joseph Owendale Rudd, DSM. Others who distinguished themselves during the assault on the mole were Mentioned in Despatches, including Able Seamen Leopold Newland and Henry Gillard and Stoker McCrory. Stoker Norbert McCrory had previously served in the RAN Bridging Train at Gallipoli and when that unit was disbanded in 1917 he served with the Australian Imperial Force in France. He was also later awarded a Belgian Croix de Guerre for his service in Thetis. Able Seaman Henry Gillard was also later award a Belgian Croix de Guerre for his service in Vindictive. Able Seaman Leopold Newland, awarded a Mention in Dispatches for his bravery (symbolised by the oak leaf emblem on the Victory Medal). Able Seaman Henry Gillard, awarded a Belgian Croix de Guerre for his bravery (Seamans Storming Party from HMS Vindictive). While tales of naval operations and battles invariably feature warships, technology and equipment, the key factor of naval capability remains the sailor. The bravery displayed by the eleven Australians who participated in the raid on Zeebrugge is a remarkable demonstration of courage which has become a hall mark of the Australian sailor. 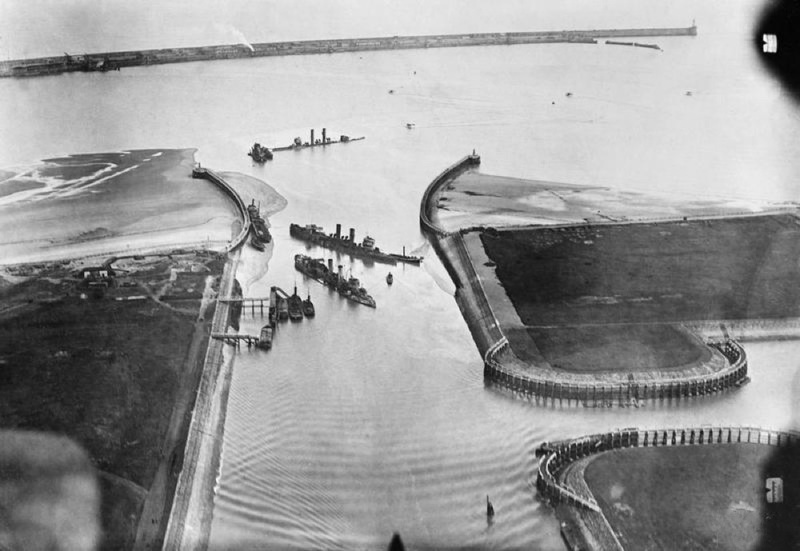 Aerial photograph of Zeebrugge showing the sunken blockships, late April 1918. H Newbolt, 'Naval Operations, Vol V, History of the Great War', Longmans, London, 1931. ↑ James J Atkinson, 'By Skill & Valour', Spink & Son, Sydney, 1986, p. 13.